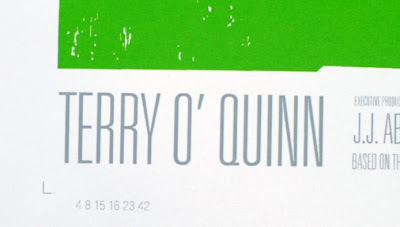 Ok maybe not exclusively revealed, as the poster has been received by several others already, but these pictures are from people that are regular contributors to this blog, so it's worth showing them off. What strikes me from the pictures I've seen of this poster and the Hurley one is the variety of objects used to hold the corners down. Thanks or the new post. :-) have some coffee before posting ! I'm not going to write much this morning as there was a free bar at the company dinner last night. scoutpost, seriously, is that the most difficult tube to open and super curly (invision window shade snaping) poster! Everyone stateside, enjoy Labor Day weekend and please be safe. Hope you have a nice Labor Day weekend too. I picked up a frame from Michael's and unfortunately it pretty much covers up the signature. Just sharing to help you with your framing choices. Subjected to blacklight, nothing intersting. no glow in the dark either. Aw, you got 108! Cool. LT- I know! (about the tube) but at least it protected the poster. I'm ready for the next one, although I'm sure we'll have to wait until after the holiday. Everyone in the US enjoy their long weekend. Be safe! ReverendMilo - Thanks for the link, I hope you don't mind but I've put a copy of the numbers pic on the main post. @LT and @scoutpost I now have a pair of standard pliers at the front door to assist me with these tubes. one yank and even the tape goes. @zort I think I am the only one so far that has figured out how to use poster putty! @zort, use my images at will. My guess is we probably won't get another print until next weekend unless this one sells out quckly. 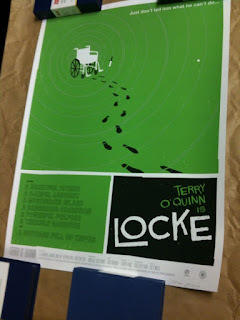 It was about 10 days between the Hurley and Locke print. They may be trying to space them out so the last print is somewhere around the premiere, right? If it's 10 days between prints, and we have 13 more to go, that's 130 days-ish, putting us at January 12th or so, not including breaks for holidays. There doesn't seem to be rhyme or reason as to the poster releases. Guess they want to keep us on our toes. With the upcoming holiday weekend, I don't expect anything until next week. Everyone have a great Labor Day weekend! So right about the curliness! They must have rolled them up while they were still warm off the press, heheh. And the paper is pretty thick stock too, so it fights back almost! P.S. Folks! Don't bust the tube! Just take an exacto knife to the tape around the cap seam that's about 5 inches in from the end. Then the cap section just slides right off. One poster I would definitely buy is one the featured the count down clock in the Swan station. I personally don't think the print sales figures are the trigger for releasing the next one, I think they have dates in mind for each one. I'm going to predict that the next URL will be in the Mysteries Of The Universe video on Tuesday. That's too early. It'll be the week after next. 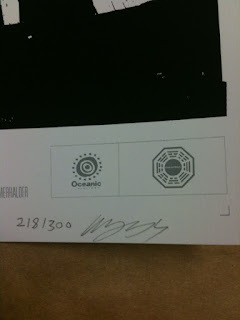 Also on display Sept. 10-13, is ABC's Lost. In celebration of the Emmy® Award-winning series Lost entering its final, thrilling season, ABC Television Network presents a can't-miss experience for all fans. Guests will be able to step into the world of Lost and see a selection of props, set pieces, costumes and collectors' artifacts from key moments in the series, as well as sign up for "Lost University," a special Blu-ray™ and online experience, and receive a limited-edition collectors' pin, available only at the D23 Expo. This thing seems like the perfect place to release the link to the 4th screen print.... and even if they don't do it there the event definitely seems worth visiting for folks in southern California as there seem to be other goods involved. I'm curious what the pin will look look like and what the "special Blu-ray and online experience" is referring to. Congested - Sounds like fun if you can get past the Disney element. That would be a good venue for release Congested. I wanted to join D3, but I really can't afford it and I'm not near anyplace where I could cash in on the Disney perks. The magazine that comes with membership is great, my local Barnes and Noble was selling it for a while and I could get it without joining, but I don't see it now, probably wasn't a big seller. Ah, hooray, there's a new clue up. Larchmont is on Long Island... dunno if there's a Wall St. there, but very happy the clue is local to me! Thanks for the heads-up, Amy Lynn! Looks like you're going to be our representative in NYC. What's on the corner of Larchmont and Wall Street? Wow,a clue on a holiday weekend! I was thinking of going to that D3 thing, but since they were showing the Lost Auction items I saw at Comic Con, I decided not to go and fight through all that Disney stuff! Is there a Wall Street in Larchmont, Long Island?